The team at the Plowden Arms left the pub at the start of April 2017, which is such a pity. I’ve left the review up for posterity. The pub reopened late May under new management with a different menu, but not one I am likely to go and review. This week’s review is the first ever of a restaurant outside the RG1 postcode; scandalous I know, but there’s more to living in this little town than easy access to the Oracle, Friar Street and Broad Street. So rather than try another city centre restaurant I hopped in the car on a chilly weekday evening and made for the Plowden Arms, a proper little old pub on the road from Reading to Henley. I have to say, I love a good pub; it’s one of the things (along with queuing, not to mention sighing and shooting evil looks at queue jumpers) that Britain does better than anywhere else in the world. The Plowden Arms has everything you expect from a classic English country pub: low beams, an open fire and a freezing loo (the better the pub, the worse the toilet in my experience). The fire was lit when we arrived, and the room was cosy, if a tad empty. There were only three occupied tables, and it was a bit sad to see they weren’t busier. Some pubs are really restaurants in disguise – all posh furniture and pretensions – and some pubs don’t really know what they want to be, like boozers going through a midlife crisis. The Plowden isn’t like that; for better or worse it is a pub that serves food, and the dark furniture and slightly uncomfortable banquettes were testimony to that. We were greeted warmly and given menus but they only tell half the story at the Plowden. The blackboard up by the bar listed loads of specials – four starters and four mains, almost as many dishes as were on the printed menu. Our waitress – who was nothing short of charming all evening – told us that these change every couple of days. I can’t tell you what a good signal this sends out. It says that the chef is using what’s fresh and seasonal, being inventive, always changing and always improving things. Why don’t more restaurants do this? Even the most high end restaurants in the centre of Reading rarely offer more than one special. Overall, it was one of those menus where you want to order everything and know you can’t. 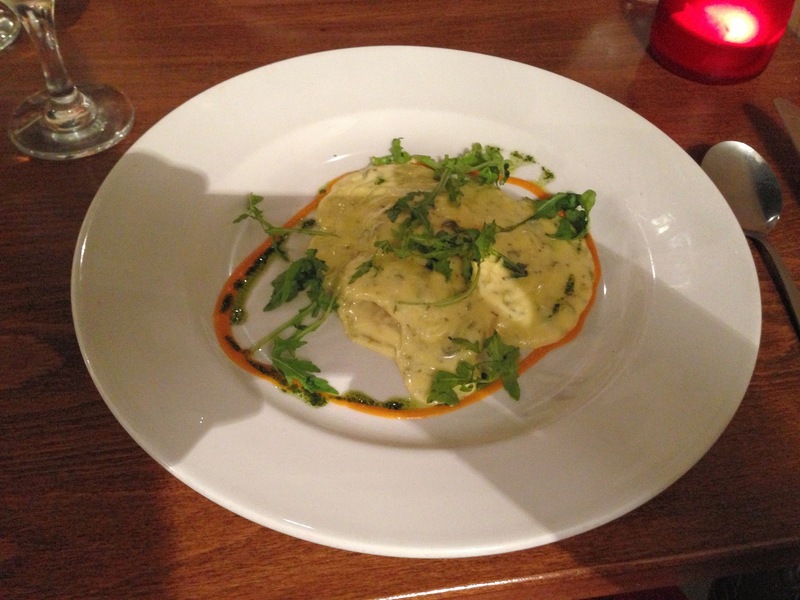 It’s worth pointing out how reasonable it is too – the starters hover around the £7.50 mark, few mains are over £15. Looking at the flip side of the printed menu made the choice even more difficult – a whole extra section of “Drinking accompaniments and simple dishes”, all of which were just as tempting again. Whilst agonising over the menu we ordered one of the drinking accompaniments, a salt cod scotch egg, to give us something to snack on as we made up our minds. This was a lovely amuse bouche, if you like, nice runny yolk with a soft layer of fish and a tart, fresh tomato sauce underneath. A good start, although I confess I prefer a sausagemeat scotch egg for juiciness, and the salt cod (ironically) didn’t taste that strongly seasoned. When the starters arrived there was definitely a bit of food envy and I also fancied stealing the vintage plates. The beetroot and blue cheese pithivier, from the specials menu, was the favourite. I know beetroot and goat’s cheese has become a menu cliché across the country, but pairing beetroot with blue cheese was a masterstroke – the sweet beetroot against the salty tang of the blue cheese was a fantastic combination, and one I wasn’t used to. The pastry was crumbly and buttery, and I simultaneously wished the dish had been twice as big and knew that the flavours were so rich and intense that more would have been overwhelming. The other starter, from the a la carte menu, was billed as “hashed lamb with charred bread” and is apparently based on a dish by Mrs Beeton. It was less successful, although that might be partly because I didn’t quite know what to expect. 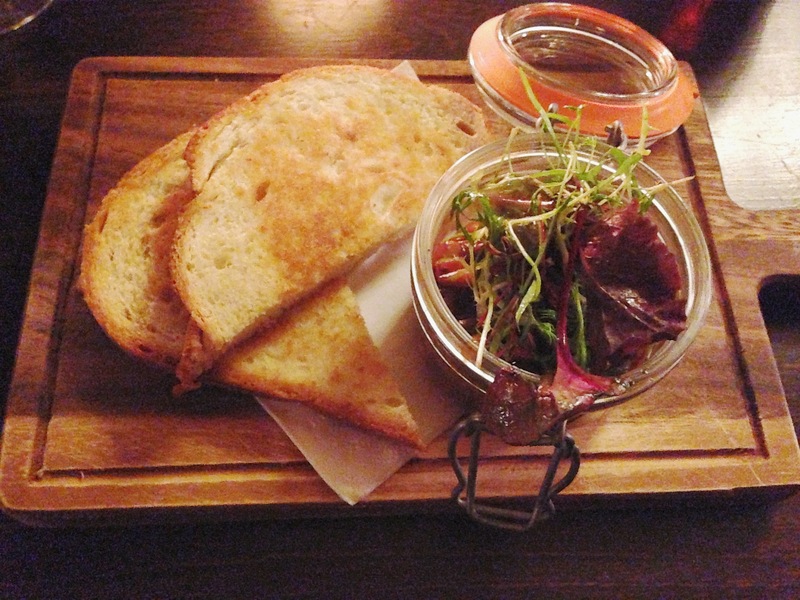 What I got was a Kilner jar of slow cooked pieces of lamb in a rich dark gravy with what looked like haricot beans. The charred bread was toast, for better or for worse. The lamb was topped by tiny fronds of little salad which didn’t add much. All in all it was more interesting than it was delicious, though I didn’t mind it. I was expecting something a little less sloppy and more spreadable, so maybe the mistake was mine. It was probably the only misfire of the evening. The mains were also a study in contrasts. 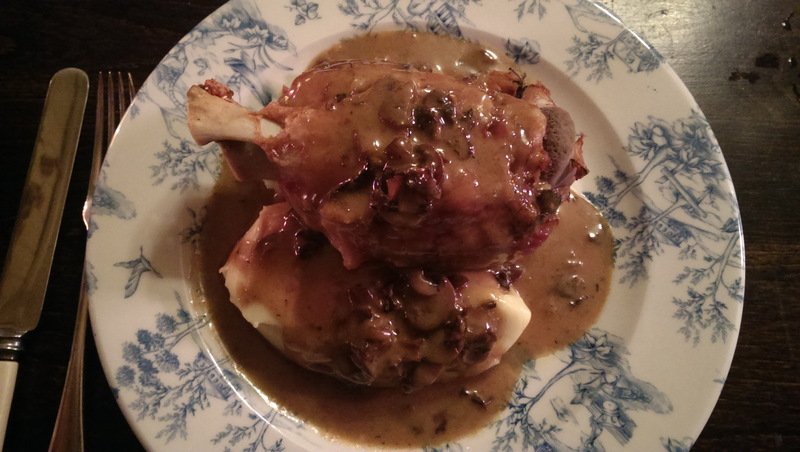 The slow cooked ham hock with mashed potatoes and a sherry and mushroom sauce (from the a la carte) was huge. I mean, absolutely enormous. The ham hock was a whole hock, bone and all, the size of a lamb shank – so big that it was almost intimidating when set down in front of me. The meat was perfect – soft, pink, no hint of grim wobbliness – and it fell away from the bone with convenient cleanness. The mash was one of the best I’ve tasted – rich, creamy and smooth, the texture just right. The sauce was equally impressive, somehow both sweet and salty, bringing the whole dish together. It was all very substantial but also the kind of dish you can’t bring yourself to stop eating, even if you’re ready to pop by the end. The other main, from the set menu, was sea trout with celeriac pureé, samphire, new potatoes and a clam and chive cream sauce. Sounds like a lot of different things going on but it was as delicate and precise as the ham hock was hearty and primitive. Every component was perfect, and every component worked with the rest – the sizeable fillet fresh, subtle and falling into flakes, the little bundle of samphire underneath it with just enough crunch, the sauce again creamy and intense – powerful enough to set off against the trout without drowning what can be quite an understated fish. This is a kitchen that knows how to do sauces so good that you slightly regret the fact that this is a restaurant that doesn’t bring you bread to mop up the rest with. That’s about the only criticism I can come up with about the mains, which tells you a lot. Sadly driving meant we couldn’t make the most of the wine list. The wines by the glass – between us we had a Chilean merlot and a French pinot noir – were safe and tasty but not wildly exciting. It’s not by any means a big wine list and this did seem a little jarring given the undoubted quality of the food they are serving. Perhaps this is another sign that this is a pub that serves food rather than a restaurant, but I still felt a little disappointed by that. When the first two courses are that good, dessert is inevitable. 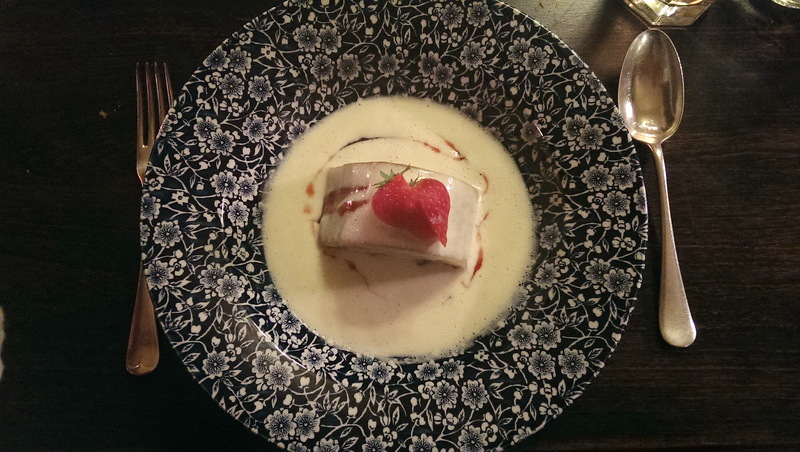 As I’ve said previously, I do like a school dinner dessert and that made it impossible to resist the jam roly poly. It was exactly how you would want it to be – a classic example of the genre, only ever so slightly refined. So the slice was lovely and dense, the poly (the roly? where does the name come from anyway? I bet the Plowden Arms probably knows) was beautifully jammy and not overly sweet, but the slice was also just the right size and the custard surrounding it was wonderfully light, almost like a crème anglaise. This was like a school dinner at a school much better than the one I’d gone to. Again, the other dessert was about as different as you can get. It was described as chocolate mousse and gingerbread biscuit with hazelnut and orange cream but it was so much more than that. The cream was between layers of ginger biscuit, like a dense millefeuille, and gave me the hugely satisfying experience of whacking it with a spoon until the biscuit (not too dense, not too delicate) broke up into bits small enough to eat. The chocolate mousse wasn’t really mousse. 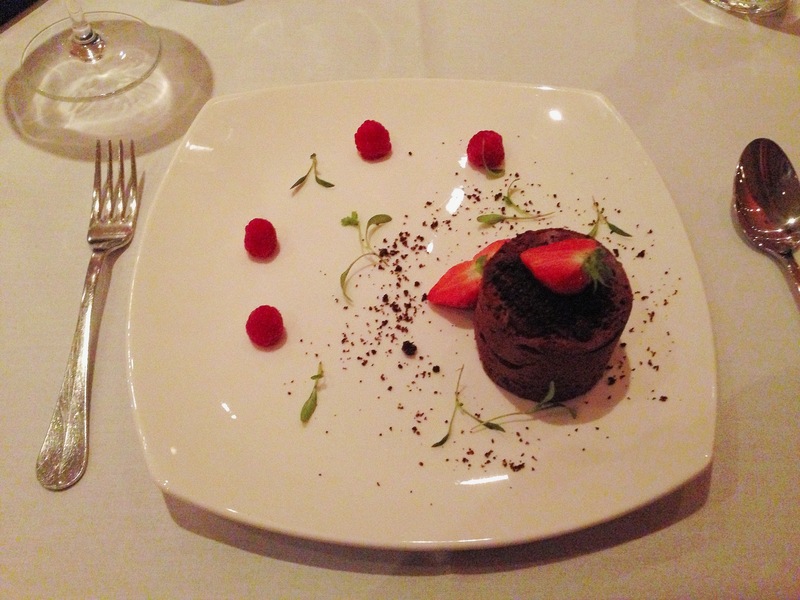 Instead it was a dark quenelle of what seemed more like ganache – intense, smooth, glossy. Like the pithivier it was a portion which looked too small before you started it but which you realised was just right once you’d finished it. This is no mean feat in a kitchen, every bit as much of a talent as changing your menu several times a week or making sauces that knock people’s socks off. I haven’t said enough about the service, which was lovely: friendly and informal but also knowledgeable and polished. Everything about how we were looked after was spot on – from laying and relaying the table to serving from one side without leaning over you (it might sound like a small thing but it’s one of my pet hates). By the end I was sorry to leave and faintly aggrieved that there were so few diners that night. The bill for three courses for two people (plus that scotch egg), three glasses of wine and numerous soft drinks was £80. I don’t know anywhere in town where I could eat that quality (and quantity!) of food for that amount, though of course it’s tempered a little by the effort of getting out into the sticks. That said, by the end of the meal I was itching to come back and already planning a return visit – it’s the sort of place where I could easily see myself settling in by the open fire with the Sunday papers. When I think back on it, more than anything, I think the most impressive thing about the Plowden was the sheer range of cooking on display. I felt like we almost sampled two different meals – one hearty, warming and enormous, one clever, dainty and delicate. To find a restaurant that can do one of those things is a wonderful discovery, to find a cosy pub that can manage both is verging on miraculous. So yes, I loved the Plowden Arms. Can you tell? Food this good, this reasonably priced, this clever and this well served should be eaten by a lot more people, and I hope if nothing else my review might help to do something about that. Café Yolk stands apart from all the other places I’ve reviewed so far in one important respect: it’s the first establishment I’ve visited that was completely full. When I arrived, at Saturday lunchtime, practically every table was occupied (except for the ones outside which seemed a bit hopeful on a crisp November afternoon) and it took a little while before I could sit down and peruse the menu, written out, blackboard-style, on the back wall. To understand why, you need to look beyond this little, attractive-looking café, tucked away on the edge of Reading’s leafy university area, and wander into the altogether more weird and wonderful world of the internet. Yolk, you see, is incredibly popular. 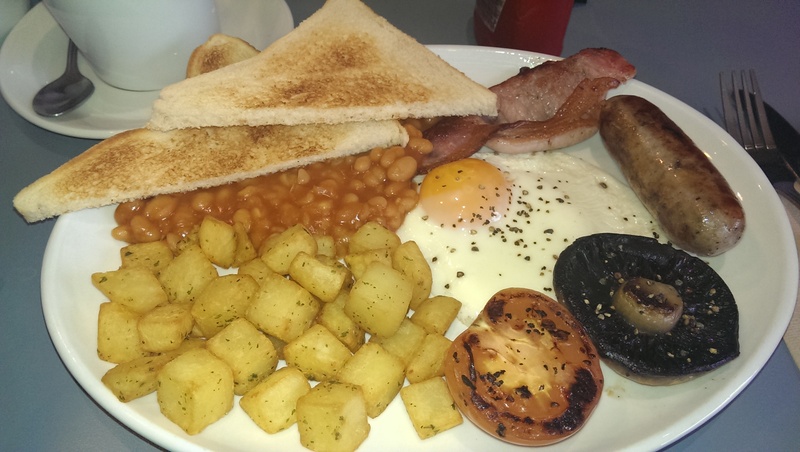 Active and engaging on social media, they are (at the time of writing) ranked second in the whole of Reading on TripAdvisor: a glowing review goes up every few days, all praising the breakfasts, which are said to be the best in Reading. How could I resist going to see what the fuss was about? The first thing I noticed, apart from how busy it was, was just what a loud room it is. It’s all hard chairs and bare walls, and that many tables of people chattering away creates an almost deafening cacophony. Yolk has definitely made the most of its location, and most of the clientele are students; skulking in the corner I felt a bit like I’d wandered into an episode of Skins by mistake. The tables are bog-standard café issue (mine hadn’t been wiped when I sat down – always a nice first impression, that) and the chairs were the kind of rigid stacking kind you wouldn’t want to spend too much time on, but all of that is beside the point, right? Because it’s all about the breakfast. There are no paper menus, but looking at the blackboard the emphasis was definitely on breakfasts and burgers, the latter described as the “lunch menu”. Once the queue had cleared away (which, bizarrely, took some time – where were they all sitting? Was there a secret basement I didn’t know about?) I went up and placed my order; full English with well done bacon and a Swiss cheese and Portobello mushroom without toast. I had to repeat my order, as if I’d asked for something extremely complicated. There was no coffee because the machine was broken that day, so I got two large teas. This gives me an opportunity to indulge in my first rant of this review, because Café Yolk charges extra for a large tea. You might think I’m a bit odd for objecting to this, but I think this is nothing short of a scandal. It’s hard to imagine a product cafés make more money on than tea. I know how much it costs to buy a box of teabags, and how much it costs to boil a kettle; charging one pound fifty for the privilege is verging on extortion at the best of times. But an extra twenty pence for a little more water? Really, it’s taking liberties with a good proportion of your customer base. Anyway, I took my two cups of hot water with a teabag in them, each costing me the best part of two pounds, and walked all the way to the other side of the café to put milk in them. I know, I know, I’m whinging. But it’s beside the point, right? It’s all about the breakfast. Our food took a reassuringly long time to turn up – nobody wants to feel the ping of a microwave is involved in the most important meal of the day – and the chap delivering the food was cheery and keen to bring over any extras (butter, sauces etc.) which was a nice contrast to the counter service. The omelette, though, was really poor. 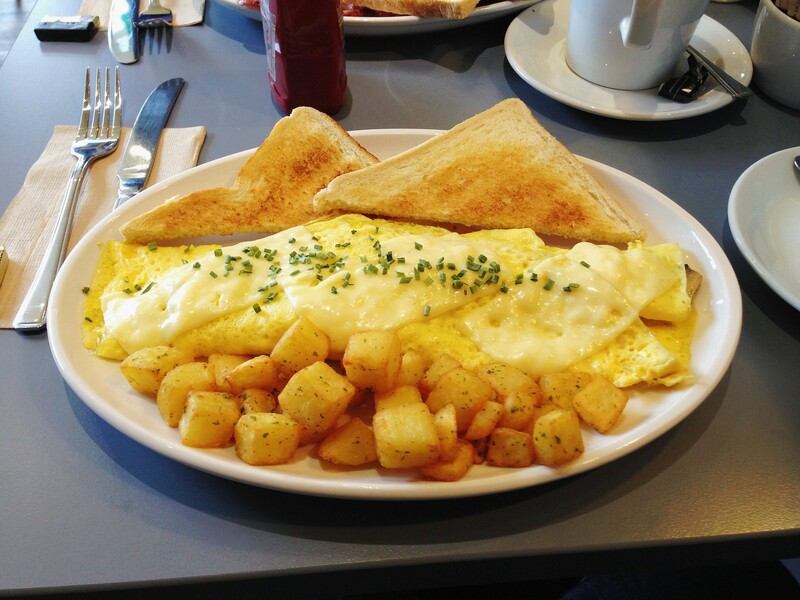 A good omelette is thick, seasoned, gooey in the middle, folded over and full of wonderful things. What I got instead was a thin frittata, no seasoning, cooked completely through and rolled into some kind of surreal egg spliff. The Portobello mushrooms were in the middle, gently staining everything a murky grey. And the cheese? Rather than grate cheese into the omelette mixture, which might have made it taste of something, three slices had instead been draped on top of the whole affair, seemingly minutes before dishing it up. The irony of a place called Café Yolk doing something so awful to eggs wasn’t lost on me. Apparently their eggs are free range, and from a local farm; it’s a pity they don’t treat them better than this. They should thank their lucky stars they aren’t called Café Mushroom, because the mushrooms were even worse. They seemed to have been prepared by someone who liked neither mushrooms nor cooking. Well cooked mushrooms are an amazing thing – all dark and sticky and savoury, salted, peppered, buttery, maybe with some Worcester sauce in there to complete the magic. These, instead, were flabby, drippy things, a limp parody of what I’d been hoping for. They were “cooked”, in the sense that they weren’t raw, but not cooked in the sense of having been prepared by a chef. If it wasn’t for the overpowering taste of vegetable oil I would have thought they’d been microwaved. My omelette came with the toast I told them I didn’t want. I didn’t eat it. I think I must be missing something about Café Yolk. It’s a lovely spot, with loads of potential, and it clearly knows what it’s doing. It’s identified a market, it’s got a strategy, and it is doing very nicely out of it. Maybe if I was a student this would be my favourite place in the world. But it’s many years since those happy days, and for me this was just a greasy spoon pretending to be something better. I left it wanting better: better ingredients, better service and above all better cooking. You can get better breakfasts at Bill’s or Carluccio’s, and you can get more honest breakfasts at dozens of cafes across Reading. I think Café Yolk is best summed up by the bacon that came with my Full English – they class that as well done, and maybe they believe it, but I don’t. If that puts me out of step with the rest of Reading, so be it. To everybody’s surprise, Forbury’s closed in April 2019. I’ve left the review up for posterity. It’s hard to believe that Forbury’s is less than 10 years old; it’s integral to the Reading restaurant scene and one of the few serious challengers to established restaurants like London Street Brasserie and Pepe Sale, both of which I’ve already reviewed. It’s always been a conservative, if reliable, place and, despite chefs coming, going and (in one case) coming back again it feels like the food on offer hasn’t hugely changed from one year to the next – good, technically proficient French food in one of Reading’s most sophisticated rooms, and a wine list full of opulent treats and slightly more economical delightful surprises. All that has changed though, recently, with the arrival of new head chef Tom Kneale. Based on Tom’s Twitter feed – which also gives a fascinating insight into just how hard running a kitchen can be – it looks like he is determined to shake up Forbury’s and add some edge to all that Gallic sophistication. First, in the culinary equivalent of Tony Blair scrapping Clause Four, he took the salt and pepper off the tables (apparently only three diners asked for them to be returned). Then pictures of all sorts of interesting new creations began to appear. An amuse bouche of black pudding with chocolate and crab on crispy chicken skin? A starter of raw tuna, crispy pork skin and lemon emulsion? I was sold: nowhere in Reading is doing anything quite that imaginative so I reckoned I owed it to myself (and you, of course) to go and check it out. I really like the outside space at Forbury’s. Obviously it truly comes into its own in the summer but as the dark evenings draw in the outside lights twinkle like an early Christmas tree and the restaurant looks properly inviting. On stepping inside it seemed like nothing and everything had changed; the decor and layout were all exactly as they’d always been, but nearly all the front of house staff were new faces. A clean sweep from the new broom? The menu had definitely changed, too. It sounds like a minor thing but the set price “market menu” is now on a separate piece of paper, giving the a la carte a little more prominence. In the starters, there were some signs of the new dishes making it through onto the menu – the “63c duck egg with onion broth, compote and foraged wild mushrooms”, for instance – but the mains still seemed very similar to the Forbury dishes of old. Perhaps, I thought, it would all be about the execution. Although I was sorely tempted to order everything off the a la carte, I thought it was only fair to try out both menus to give you an idea what to expect at either price point. Besides, the market menu has always struck me as a good deal if you’re looking for fine dining in Reading: the price has, naturally, slowly risen over the years (it’s now £23 for three courses) but it’s still great value and, unlike Forbury’s closest natural competition (Mya Lacarte, London Street Brasserie) the set menu is available all week, the only restriction being that you can’t order off it after 7.30pm on a Saturday. The amuse bouche didn’t betray any signs of the new approach. Sweet white onion and apple velouté was pleasant, and an interesting combination, but it was very much the kind of amuse bouche Forbury’s has always done. It was also one of the starters on the market menu, so it didn’t feel like anything out of the ordinary – in fact I’d have felt a bit cheated if I’d ordered it from the set. Perhaps it was my fault; based on those Twitter pictures I’d been expecting black pudding, chocolate, crispy skin, all kinds of miniature treats and nothing in an espresso cup is going to match up to that. They do manage the timing of a meal superbly at Forbury’s, and the starters arrived just when you wanted them to – not so soon that you felt turned, not so late that you were considering asking nicely for more bread. It sounds like something you should be able to take for granted, but so many restaurants get it wrong. “Home-made pork pie with house pickles and salad” from the set menu was lovely, if exactly what you would expect. The meat was perhaps a little coarser than I’d personally like (no jelly though, which is always a relief) the pastry somehow lacked the lardy crispness of a properly great pork pie. 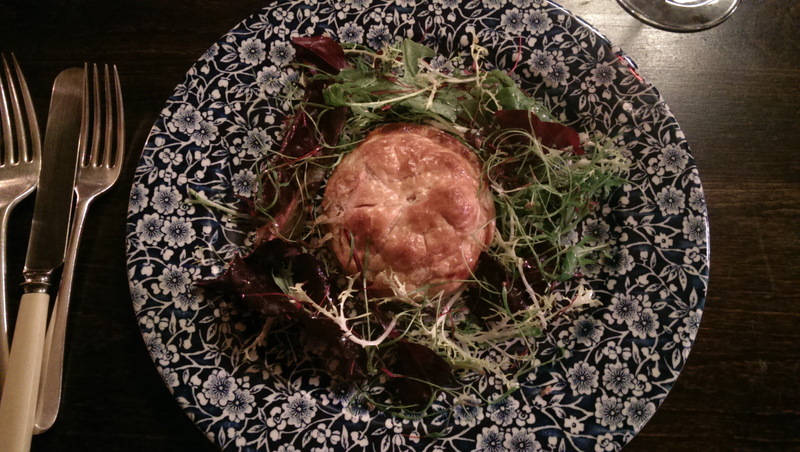 The smear of English mustard was a nice touch, if a tad generous, and the little thicket of salad leaves was really delicious – lightly dressed and sweet, which was a lovely contrast to the pie. The pie managed to both be heavy and small, which made me feel a little ungrateful on several levels all at once. Cornichons had a nice crunch but were largely indistinguishable from the ones in a jar in my fridge (maybe that’s why they were called “house pickles”). From the a la carte the “Brixham crab, dill oil, shallot ketchup and watercress” looked less appealing. I was expecting something like a tian but this was altogether soggier, claggier and less delicate. There were little blobs of what was billed as shallot ketchup but my palate must have been playing tricks on me because I got a lot of citrus and not much dill or shallot. This all sounds very harsh, so I should add that although it wasn’t what I was expecting it was very tasty indeed. The small heap of watercress on top, though, added little to the experience. At this point it’s worth mentioning the one obvious big difference at Forbury’s: the staff. Forbury’s has always offered that wonderful, unobtrusive service that the French, when they get it right, are so brilliant at. You know the sort: the waiting staff are right on hand whenever you want anything, top up your glass when it’s getting low but the rest of the time you don’t even notice them. It’s this last bit that’s the real skill, and it’s also where the new team have a bit of work to do: our glasses, for instance, were regularly topped up, whether we wanted that done or not. Unfortunately, the solicitousness didn’t end there. To give you another example, two minutes after our starters arrived we were asked if we were enjoying them. Fair enough, although waiters always seem to appear to do this when you have your mouth full. Less than two minutes later we were asked again about our starters by a different person. That same person asked again as she was taking our empty plater away, just in case she had forgotten our original reply. The overall effect was more of neediness than service. What doesn’t help is that the waiting staff didn’t seem to be divided into sections: everyone seemed to cover every table, so they didn’t know what you had or hadn’t already been asked. Maybe this is exceptional as we were there on a week night, maybe it just shows how keen the staff are: either way it needs to be toned down a little. We weren’t asked about the mains quite so frequently, thank goodness. 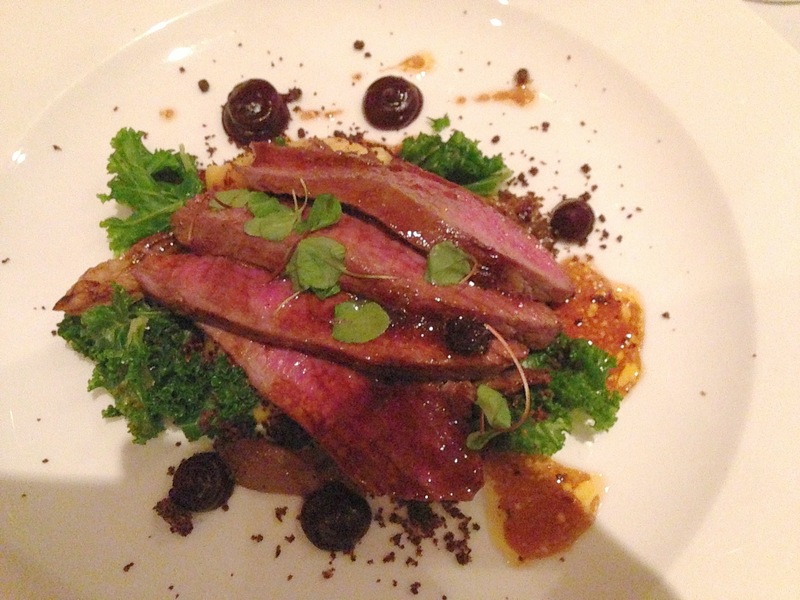 “Haunch of venison with swede, purple kale, mushrooms and cherries” (from the a la carte) was simple, well executed and delicious. The venison was a generous portion, pink and tender, resting on a bed of pureed swede with a few kale leaves in between. The cherries were cooked into a jam-like state and then reformed into tiny perfect domes on the plate, a lovely piece of technique on what was otherwise quite a straightforward dish. This nearly brought out the best in the venison, although overall I found the whole thing a little on the sweet side. Luckily the waitress had suggested some duck fat chips, served in the ubiquitous little frying basket, which made the meal feel complete. Pan fried sea bream with herb crushed potatoes, salsa verde and green beans, from the market menu, was less successful. The fish was a beautiful fat piece of bream, cooked so the flesh flaked under a fork and the skin crackled under a knife. The rest of the dish didn’t give it the support it so deserved. The potatoes appeared to have resisted the crushing process largely unscathed, the promised salsa verde just didn’t show up at all and overall it felt like a dish that could have been so much more with only a few little changes. All of this was washed down with a very reasonable bin end – an Australian pinot noir at £35, “Cruel Mistress”, which was gorgeous. It had more complexity to it than some of its New Zealand siblings and just about worked with most of what we had ordered – enough substance to stand up to the venison without drowning out the bream (yes, I know people say you shouldn’t drink red with fish, but I’m a heathen about this sort of thing). For dessert we didn’t fancy anything off the set menu so we went wild and ordered from the a la carte. This turned out to be a very good idea; the desserts were the high point of the meal. The fig and honey tart with vanilla ice cream was delightful. It was served in a deep bowl and the topping was part bakewell, part macaroon – lovely, light, chewy and meringue-like, it had me scraping the edges of the bowl with my spoon. The honey was almost undetectable but that didn’t take anything away from what was essentially a very well done school dinner type dessert. I love a hot pudding (although I’m not sure I was expecting one from Forbury’s) so this was perfect for me. The Valrhona chocolate mousse with mango sorbet and chocolate soil was glorious – deep, dark, rich and bitter, and completely transformed by the gritty crunch of the chocolate soil. It didn’t need the mango sorbet, although it was so green and fresh that I wasn’t going to turn it down. The only slightly bum note was the microshoots of coriander strewn across it. I tried enough to decide it didn’t work and left the rest, but it didn’t detract from one of the best desserts I’ve had this year. I sense, from my visit, that Forbury’s is still a work in progress. Dinner for two, including one bottle of wine, came in just shy of £100 and I thought it was good value. The thing is, I had a lovely meal, with more hits than misses, but it wasn’t the meal I was expecting. There’s a sense of nervousness about the service and a little bit of risk averseness about the food. I can understand why – it must be difficult, stepping into a local institution like Forbury’s, and getting the balance right between evolution and revolution – and I saw enough to think that they’ll get there, but my overriding impression was frustration that they haven’t moved a little bit quicker. The most telling thing about the meal? Just after I paid, I spotted something on the table which I’d previously missed: the salt and pepper mills were there in front of me. Next time I go, and there will be a next time, I hope they’re gone for good. When Neneh Cherry released her debut album back in 1989 I don’t think she realised quite how much damage she would do to the sushi industry; there’s still a common misconception that sushi equals raw fish, and that puts lots of people off it completely. Perhaps in light of that, the inappropriately named Sushimania has a large koi carp mural on the wall with the words “so much more than just sushi” above it. This, along with the bright red bar and red and black furnishings make the most of what could otherwise be an uninspiring spot, opposite the Hexagon Theatre (surely one of the foremost contenders for Reading’s ugliest building, along with the Civic Centre next to it). It’s taken over from the equally inappropriately named Thai Nine, which used to do all you can eat Thai, and… err… sushi. In many senses the change isn’t that marked – it still does sushi, the tables and chairs are still the same and the menu is still all you can eat (for £15.80, in fact). But when we arrived, at 8pm on a midweek night, it was clear that Sushimania was still bedding in because, far from the bustling restaurant that used to be there, this was a much emptier venue. Remember Lobster Room? Well, the sinking feeling on being guided to our table was much the same here. It took a bit of effort, and a little help from a waiter, to understand how the ordering works. There’s a sheet of A4 paper, folded into thirds, printed with the names of all the dishes with spaces to write how many you want of each. There’s also a glossy menu with a similar list, all photographed and funky looking with brief descriptions of the dishes. We picked from the glossy menu but were stumped to find that the menu didn’t tie to the sheet of paper we’d been given. How were we supposed to pick all of our choices when they weren’t all on the order form? How did it work? Well, it turns out there are four different types of dish at Sushimania, and it’s not exactly all you can eat all inclusive after all. Here comes the science bit: you might want to concentrate for the next few paragraphs. First of all there’s the bog standard all-you-can-eat; order as many times as you like, no more than six dishes on any round. Simple. Then there is the not-quite-all-you-can-eat; the dish is included in the all-you-can-eat but you have a maximum of three portions in each visit. Fair enough, I suppose. Next there are the all-you-can-eat-but-you-have-to-pay-extra dishes; most of the time this means an extra couple of quid per dish so it’s no biggie, although you won’t know which dishes this is until you look at the order form. The main items here were all the sashimi dishes except salmon, so if you don’t like raw fish you might be pleased to see that Sushimania does charge a premium for it. Okay, so the final option is for those dishes which aren’t on the all-you-can-eat menu at all. These are full price and appear in the glossy menu, but not on the order form. They have to be ordered by actually speaking to a waiter, something that is otherwise not strictly necessary in Sushimania. This includes a lot of the interesting-looking stuff I’m afraid: many of the more unusual starters like seared salmon and tuna, the bigger sashimi plates and really quite a lot of the main courses. To recap: there are four different types of pricing and working out what your meal is going to cost is the kind of mathematical challenge that makes the numbers game on Countdown look like the two times table. The good news, though, is that once you’ve navigated your way round the menus and the food begins to arrive, things start looking up. My first course was a selection of sushi and sashimi, and it’s fair to say that although Sushimania may be more than just sushi, they’ve got the basics right. I love avocado maki (the creaminess of the avocado against salty soy and seaweed is always a favourite – a simple classic) so I was pleased that Sushimania does them very well – plump, well rolled, far tastier than they were at Thai Nine or are at Yo! Sushi just down the road. Spicy tuna maki, with a dollop of piquant orange-red sauce on the top, were also very well done, as were the katsu prawn uramaki and the crispy salmon skin teriyaki hand roll. Sashimi – both tuna and salmon – was also delicious, although the size was on the conservative side, especially when you’re paying a premium for the tuna (not the salmon, although it’s one of the things you can only order three of – remember? honestly, the menu was a minefield). At this point we were smiling and patting ourselves on the back for making it through the door and navigating the riddles of the menu. The waiting staff were attentive and interested enough to ask what we thought of the food and it was nice to be able to give good feedback and mean it. We each ordered a second glass of the house white (an ugni blanc which was incredibly easy to drink, fresh and light if not particularly complex) and kicked back a little. On the non-sushi side of things it was more hit and miss. The Japanese starters were generally very good. In particular the tori karaage was terrific; moist chicken thighs fried until the coating was crispy but the meat was still tender inside, a grown up chicken nugget. The chicken gyoza were super light with nice hint of spring onion to them that made them taste clean and fresh. Yakitori chicken skewers were one of my favourites – again, cooked just right, smothered in sticky smoky sauce and sprinkled with sesame seeds. The prawn tempura, though, was adequate rather than great. The batter was too thick and under-fried and they felt like more of a chore than a treat (although I’m afraid I did eat them all – it always feels especially rude to leave something you’ve ordered on an all you can eat menu). The Japanese mains were where I really felt let down – especially as most of the mains I fancied weren’t on the all you can eat menu. We only ordered a couple, because we were getting full by then, but even then they were disappointing. The beef yaki soba was a fun-sized portion of noodles with three or four tiny rubbery pieces of beef plonked on top. It was so short on flavour that the one mouthful I had which contained ginger only served to highlight how poor the rest was. The salmon teriyaki was similarly small and underwhelming; normally teriyaki is rich and salty-sweet but this was thin and underseasoned and the fish itself was flabby with slippery skin. It was a shame that these were our last dishes, because it meant that the meal ended on a bit of a low note; I was sorely tempted to order another round of maki but even I’m not quite that greedy. Instead we decided enough was enough and asked for the bill. Food for two with two glasses of wine each came to £54 including the optional 10% service charge. When settling up we complimented the waiter again on the food and he seemed genuinely pleased that we’d enjoyed it – which again felt like a change from Thai Nine where the service always had a rather monosyllabic, functional quality to it. When I started writing this review I honestly intended not to take the “old versus the new” angle, but looking back I can see that’s just not possible. And it’s hard not to be delighted that Sushimania is so much better than Thai Nine was. It’s not perfect by any means: I do think they need to sort out their hopelessly convoluted menu, and based on my experience they might want to erase that wording saying “so much more than just sushi” (or improve the non-sushi dishes, which were such a lottery during my visit) but overall there’s an awful lot more to like here than not. Hopefully it won’t be long before people are having to fight to get a table here – at which point I’ll no doubt complain that it was so much better in the good old days. N.B. The Lobster Room closed in March 2014. I’ve left the review up for posterity. Sometimes, when you’re out in a restaurant, you get a certain kind of sinking feeling when you just know that you’re going to have a bad meal. I expect you know exactly what I’m talking about. Sometimes it happens when you’re greeted and seated, sometimes it’s when you look at the menu, sometimes when the first dish arrives. Whenever it is, though, it’s a terrible feeling because it nearly always comes too late for you to leave; all you can do is sit there, endure it, minimise the damage and chalk it up to experience. I’ve been wondering at what point in my experience in The Lobster Room I first got that sinking feeling. There are a number of candidates. It might be when I looked at the website, before I’d even made up my mind definitely to go there. There was something about the menu that flashed warning lights, although I couldn’t put my finger on what it was. Perhaps it was the spelling mistakes (calamari was accompanied with sweet chilly sauce, which sounded a little, well, cold). Perhaps it was the slightly bizarre choice of words: Goan prawn curry came in a spicy coastal gravy, crab was served on an aromatic and flavourful hill of tagliatelle. Or maybe the sinking feeling came in when I entered and went down the stairs to the cellar restaurant. The greeting was marked more with surprise than warmth and the waiter – voluminous white shirt tucked into Status Quo jeans – responded to the request for a table for two with a terse “sure”. You could see why, going in, and perhaps understand his amazement; at prime time on a Saturday night we were only the fourth table in there. The room, back when it was Chronicles, was a lovely subterranean space. 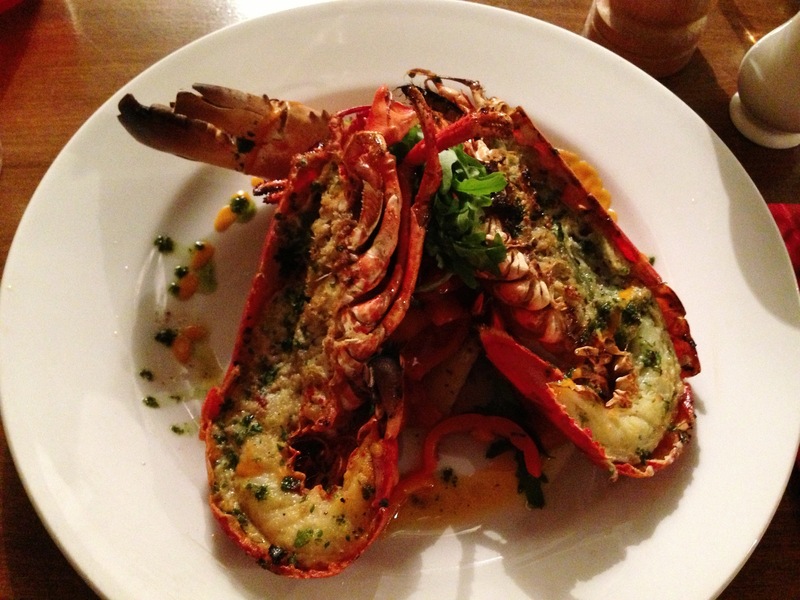 There’s a certain illicit appeal about cellar restaurants, or should be, but The Lobster Room was empty and charmless. The furniture didn’t all match and the worn, tired-looking tables looked as if they had been inherited from Valentino’s, the previous restaurant to fail in this spot. If it wasn’t then, I might have got the sinking feeling when our wine and water turned up. The wine glasses were chunky numbers with no delicacy at all and their contents were nothing to write home about. The sauvignon blanc was featureless, if inoffensive, but the Orvieto was just terrible – so watery and thin that I couldn’t be sure it hadn’t in fact been watered down. Both were almost cold. We asked for water and the same waiter – the only waiter we saw all evening, although he was hardly busy – wandered off out back and returned with two giant Stella Artois goblets full of water. One had ice in it, one didn’t; no explanation for this was offered. You hear a lot of conversation in restaurants when there’s almost nobody in there. It soon became apparent that, apart from the couple having what seemed to be an extremely tedious date in the alcove opposite us, everyone else in the restaurant seemed to be there because they were friends with someone who appeared to be the owner, a blazered man who wandered randomly round the restaurant from time to time. I had definitely got the sinking feeling by the time the starters arrived (no bread, despite the attractive picture of fresh-baked bread on the website). What was billed as lobster ravioli with lemon butter and caper cream was in fact ravioli buried under a huge wobbling mound of what looked and tasted like hot mayonnaise with a couple of capers strewn across it. At first I thought it was a generous serving of ravioli underneath a thin coating of sauce, but in fact the primary purpose of this gelatinous Hellman’s substitute was to conceal how few ravioli you got. It was, in fact, only one raviolo away from being lobster raviolo with lemon butter and caper cream, which means that each raviolo cost just over five pounds. By the time I realised there were only two of them I’d given half of one of them away, and even then I can hardly say I was cheated. The pasta was thick and rubbery and the thin smear of meat in the middle could have been Shippam’s Paste for all the difference it would have made, so overpowered was it by the hideous sauce. I seriously considered cancelling the mains and leaving after that; it’s hard to imagine any restaurant in Reading where you could so comprehensively waste ten pounds of your money on a single dish. The other starter – the aforementioned calamari with “sweet chilly sauce” was, by comparison, stellar stuff, by which I mean that it was still not very good. A little dish of wan looking battered calamari, not unacceptably springy but certainly not tender enough to be fresh, with a ramekin of standard issue supermarket chilli sauce, it was the pick of the bunch mainly by virtue of not being such shocking value. But even then: this might have been excusable in a chain restaurant, but a place called The Lobster Room specialising in seafood? No, it was just nowhere near good enough. The waiter approached the table with a Fonz-style double thumbs up as he came to take the plates away, but he didn’t actually ask if the food was any good. Maybe he was too smart to do so, or maybe the gesture was to congratulate himself for having shifted the most exorbitant ravioli in Britain; sadly I’ll never know. Anyway, by this stage it really was a question, like watching the Royal Variety Performance, of how bad things were going to get before the end. This seems as appropriate a time as any to mention the background music, which was truly purgatorial. I’ve now heard lounge jazz cover versions of, among other things, China Girl by David Bowie, Sowing The Seeds Of Love by Tears For Fears, Don’t You Want Me by The Human League and – my personal favourite – Sultans Of Swing by Dire Straits. It was more old hat than nouvelle vague; I’ve left a restaurant for less, and I wish I’d had that much sense on this occasion. The mains were no better. Fillet of monkfish with wild mushroom and pernod sauce was in fact three small pieces of monkfish tail, as much bone as flesh. Having endured the ravioli I can safely say that I was a lot wilder than the mushrooms accompanying this dish. The sauce tasted of cream and salt and the note of Pernod struggled and failed to break through. In the middle was a little heap (certainly not a “flavourful hill”) of vegetables – a few potatoes, some peppers which were just about cooked and some raw carrots. The closest these carrots had come to being cooked was having sat on a plate with something warm for a couple of minutes before being served up. That dish was sixteen pounds fifty and the best thing I can say is that it wasn’t the biggest rip-off of the evening. The lobster looked attractive enough, but disappointed at the same speed as everything else. The crustacean, neatly halved, sat on a similar pile of vegetables as those that came with the monkfish. The tail meat was reasonable – if a little tough, which suggested it had been overcooked. The “butter garlic sauce” was almost non-existent, so I never got to work out whether this was meant to be garlic butter, garlic sauce or some novel hybrid of the two. There were a few stray flecks of green which had probably been parsley once upon a time and the meat in the single claw (this is news to me, but I seemed to have been served a lobster amputee) had shrunk back a lot, which also suggested that it may have been overcooked. The lobster crackers were wholly unnecessary as the shell was soft and bendy – I’m no expert on lobster but this struck me as wrong. Perhaps it had been left after cooking for too long or maybe there had been a microwave involved, I dread to think. At eighteen pounds this dish was – and I’m really sorry to put it this way – simply not worth shelling out for. It was very quick to eat, too, and so anaemic that I didn’t even need to roll up my sleeves; no wonder they didn’t bring a finger bowl to the table. I’ve missed out so many sinking feelings. In fact, sitting in a basement restaurant having that many sinking feelings it’s a wonder I didn’t reach the Earth’s core. Here’s another one; we arrived at eight-thirty, and ordered. Our starters arrived at eight forty-five. Our mains arrived at nine. It’s almost as if they were in a hurry to serve us quickly so that we didn’t have the opportunity to come to our senses and leave. I’ve had slower meals in Nando’s, and better ones too for that matter. Anyway, it didn’t work because we did come to our senses, albeit too late: as you can probably guess, we didn’t stay for dessert. 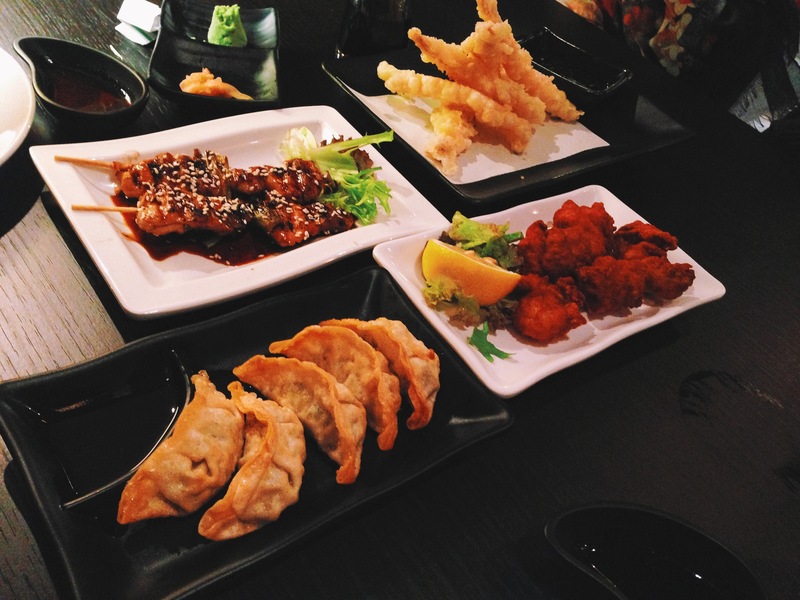 All in all two glasses of wine, two starters and two mains came to sixty-two pounds. That amount doesn’t include service (which is appropriate, as neither did my evening). I can’t imagine The Lobster Room surviving in that location, with that service, with that food at those prices for much longer. You can get better lobster at Côte or at Brown’s, you can get better service pretty much anywhere, and if you’re going to spend that kind of money Reading has dozens of better alternatives. By the end of my time in The Lobster Room I began to think that the restaurant might just be a convenient tax deduction, or some kind of gastronomic equivalent of Springtime For Hitler. If that’s the purpose, it’s succeeding admirably, but as a place which serves good food at a fair price to customers it’s a very different story.